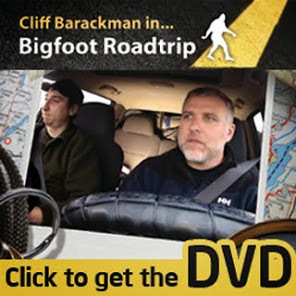 It has been a while since the Indiana episode of Finding Bigfoot aired, but I've been on the road filming the next season of the show since even before then. Realizing that I only had a couple weeks until season three premiered, I wanted to get the last two field notes out. Here you go. There are very few pictures because I'm on the road and the Indiana and Utah photos are on my home computer, but at least you have the text... Enjoy. I admit that before my visit to Indiana, I didn't think much about bigfoots being there. I had a misconception of what the terrain is like there, assuming it was mostly corn fields and rolling plains. Little did I know that the majority of southern Indiana in particular is covered with thick hardwood forests with few urban centers. I was very pleasantly surprised. The video that brought us to Indiana was not filmed in the best bigfoot habitat the Hoosier State. It was filmed in the Dunes State Park in the northernmost reaches of the state on a side road. The film was obtained in November of 2008 by a family out for a drive. It was filmed on an inexpensive cell phone and is heavily pixelated. It shows what appears to me to be a man in a monkey suit attempting to move in an inhuman fashion. The hair on the suit seems to be the kind that is bunched up and sort of fluffy; pretty typical of the inexpensive suits widely available. The thing about the film that made it worth looking into was the dialogue heard while the figure is being filmed. The man's voice is not at all compelling, and he even laughs at one point as they start to drive away. The woman's voice is neither here nor there as far as authenticity, but the children actually seem to be very upset. One clearly cries. It is hard for me to understand how an educated couple would cruelly subject their children to such a terrifying spectacle. The man from the video declined to appear with us at the location that day, but his wife accepted our invitation. She was kind, forthright, and of professional occupation. She told us that her husband worked at a university and didn't want to be associated with bigfoot for fear of some professional consequence. Her children were not with her at our recreation. We put Bobo in the same spot as the subject in the film based on the bush it was hiding behind, as well as the four large trees on the left side of the road that the subject walked by. It took some convincing on my part with the rest of the cast to put Bobo by the right tree, but they eventually saw that I was indeed correct in my placement. This location put Bobo (and thus the figure) at 36.5 yards from the camera. Bobo was able to duplicate the awkward movements of the person in the monkey suit, and was indeed bigger than the figure by at least six or more inches. It was clear to us all that this was definitely not a bigfoot, but some sort of hoax. Whether or not the videographers were in on the hoax is unknown (though admittedly likely, especially when considering that the man would not appear with us on camera). I'd like to think that people wouldn't make their children cry for the sake of a joke, so I'll give them the benefit of the doubt for now. After our first night investigation came up with nothing, we decided to move our operation southward. We set up our home base in Bloomington, a hip college town nestled between two chunks of Morgan Monroe State Forest from where numerous sightings have been reported. I wouldn't have the opportunity to experience much of the fun town of Bloomington because it was my turn to be in the woods for a three-night camping trip with cameraman Tyler Bounds. Tyler and I spent a lot of time scouting southern Indiana. There were a few highlights of our “solo” trip worth mentioning. First, while bigfooting in the cemetery seen in the episode, we got a strange sound in reply to one of the tree knocks. I don't know why it wasn't played in the episode, but perhaps the recorder didn't pick it up. The sound came from the east, and was very similar to a sheet of slightly bowed metal being popped outward. I have no idea what made that sound, as there were no homes nor buildings for several miles in all directions. In fact, we were butted right up against the only officially designated wilderness area in the state, the Charles C. Deam Wilderness Area in Morgan Monroe State Forest. Another highlight of the “solo” excursion was that strange vocalization we heard on the last night that started some coyotes off. We were at Prather Lake, the site of numerous bigfoot encounters over the previous years. Tyler and I hiked in very late at night, arriving in the wee hours of the morning. We were slowly setting up camp and doing knocks and then later calls. One of these calls elicited a strange vocalization that set off a pack of coyotes from the same area. When I heard it, I thought, “That sounds different. I wonder if it was a coyote or not.” Right then I looked over to where Tyler was setting up his tent and saw him sprinting across the ground towards his sound recorder, which was off. I guess he found the vocalization to be strange as well! Was it a bigfoot or a coyote? I don't know. I do know that whether or not it was a different animal, or a play of acoustics in the canyon, both Tyler and I found the initial vocalization to be noticeably different than the rest of the coyote sounds that followed. An untelevised highlight of the “solo” adventure that Tyler and I had was a several hour visit with a long-term witness who I will call Dana (not her real name, but she requested anonymity). She has had visits from a group of bigfoots for many years and had many interesting things to share. At first, Dana was unaware of the bigfoots, but her children were seeing them. Apparently soon after the family moved into their trailer, the children were refusing to sleep alone in their rooms because the “big ugly man” would look in their window at them. For Dana, this was at first just a case of her children having nightmares, but soon it became a larger problem. Dana would later refuse to let her son sleep in her bed with her, but would find him curled up in the hallway outside her door in the morning after he saw the big ugly man again. I spoke to her children and they both verified the terrifying events, though they are both much older now. One night, many years ago, Dana took her shot gun and went outside to see what her dogs were barking at. There in her front yard was a large figure squatting down under the only light, staring off to the east towards a pond across the road. The figure was almost five feet tall even though it was clearly squatting down. Dana stopped in her tracks, dumbfounded. Even though her rifle was in her hands, she slowly backed up and went back into the house as she watched the figure turn its head and stand to walk away. Ironically, Dana had seen a sasquatch before when she lived in Washington State. It never occurred to her that there were bigfoots in Indiana, but at least she now knew what she was dealing with. She also started to understand that the bigfoots were probably the source of her children's fear of the “big ugly man” outside their windows. There have been several more sightings of the local bigfoots since that time on or near her property. As usual, the bigfoots are heard far more often than they're seen. They sometimes bang the outside of her house, particularly when she makes a change to her routine or the outside environment. She hears the strange screams and knocking noises on occasion during certain times of year. She has even cast a couple impressions of what she believes are footprints nearby. Tyler and I spent several hours with Dana and found her to be very credible. She is interested in the bigfoot subject and now knows what to keep an eye out for. I interviewed her extensively, and she granted permission for me to record the interview. I have plans to eventually transcribe the interview and to make it publicly available. Indiana definitely has bigfoots living there. Most of them are in the southern part of the state nearer to Kentucky, as well as in the forested areas in the central zone outside Bloomington. I wouldn't be at all surprised to hear about pockets of activity throughout the entire state, though. I was quite pleasantly surprised with my visit to the Hoosier State. If you live in Indiana and know of any pockets of activity, feel free to let me know about them just in case I have another opportunity to visit. I'll be honest--that was some of the worst acting since Syfy original movie. I think Indiana would have to be a route for BF since Ohio to the NE are all areas of multiple sightings and there is plenty of countryside, water, and food. Great story Cliff! Glad you are speaking to credible people who are confirming that Bigfoots exist. I look forward to the day when I read about your own encounter with a Big Foot. Also, I look forward to many more stories and videos from you! Be safe and happy squatchin! Those parents were DEFINITELY playing a joke on their kids. I don't think that's the bad thing though. The worst part is that the wife actually ham'd it up just to be on television. Unforgivable and she should be ashamed for hoaxing the nation. I mean, prank your kids all you wish but don't waste everyone else's time attempting to sell a bill of goods. I stick by my theory that people who hoax Sasquatch ARE without a doubt mentally ill. I love stories like this, but it's too bad that they're still only stories. If anecdotes were valid as evidence of a phenomena, then the sun most certainly flew around in the sky at Fatima! 1. A fleeting sense of inflated ego due to the attention from the show's stars, and the attention of the viewing audience. Having said that, I don't think we should underestimate the power of this motivation in a society that worships celebrity and media. 2. An unspoken desire to pull the wool over folks' eyes, knowing full well that their information is false. I imagine that many 'prov-activist' skeptics would relish the opportunity to submit false positives and have members of the FB team subjectively authenticate them as real. 3. They're sociopaths who just enjoy lying and don't care about the impact of their lies, or ordinary folks with no scruples. As a person living among the flat lands of corn, soybeans, farms and Amish I must tell you that your initial impression of northern Indiana was incorrect. The area of northeast Indiana is all built on swamp land. Many farmers work around huge thickets and forests providing plenty os area for wildlife. I live in Ft Wayne - three rivers converge here. Reports abound from farmers, those fishing or playing on the rivers or lakes, and from hikers. I was shocked that the report from the Dunes was used at all. I hope to hunt around this area and around northwest Ohio and will let you know what I find. Hatred like that last dude gonna hats. Maybee his cat dropped a deuce in his Grapenuts. During the late 80s and early 90s while deer hunting in fall, I would often hear what sounded to me like someone hitting a tree with a 2×4. As I was usually perched in a tree stand, whovever was doing it was always just out of sight. This activity has left me puzzled for many years and several reasons. 1. Who would venture into the woods just to stand there and smack a tree with a piece of wood? 2. Why would this sound always be within a few hundred yards of my position, no matter the location I chose to hunt. On the few occasions I decided to pursue the culprit ,which I assumed was a trespasser hunting where they shouldn't be, I found absolutely nothing. On another occasion while wade fishing a section of Blue River with friends, several large rocks were thrown from a steep bluff top. You couldn't see who was throwing them but we yelled in anger as the rocks came dangerously close. All of this activity occurred in areas just south of Salem, IN. For a person to be responsible for anything mentioned they would really have to go out of the way and cross a mile of land by foot. I have never considered any other explanaition than idiots in the woods until I started watching your show. I have to say there hasn't been any like occurances in almost 20 years. Cliff, I grew up in southern Indiana, and yes there are Bigfoot there! They lived on our property and surrounding areas for generations, according to all of the stories that I heard from the neighbors. I live in indianapolis now, and that was a long time ago, but the area has not changed much, so I bet they are still around there. This area is in a town called Mitchell.